Introducing you to the wonders of working in the great outdoors! 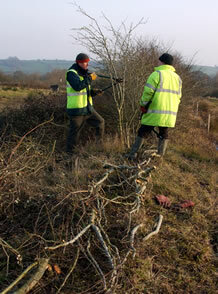 Thurs 23rd Feb - Hedge-laying - learn this traditional skill which maintains livestock-proof hedges that are good for wildlife. Thurs 1st March - Path construction - learn how to mark out, shape, edge and surface a path on a steep slope. 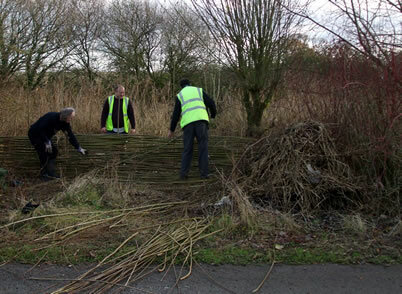 Thurs 8th March - Willow weaving - cut the willow grown on site and use it to make a multi-purpose screen. All sessions include home-made soup and cake! Booking required - To find out more or to sign up please contact Juliet: 01963 351350 or . All participants must be 19 or over and must not have taken part in another Learning Communities Fund project. *Each participant can attend one workshop free of charge, additional workshops will be charged at £40 each. This course is open to all, but people who are currently seeking work or from a disadvantaged group will be prioritised if this course is over-subscribed. Carymoor Environmental Centre, Dimmer Lane, Castle Cary BA7 7NR, www.carymoor.org.uk.